Located in the highland of Gayo, Takengon City is a worth visiting tourism destination in Aceh Province. It is a city with a panoramic view of its nature in the center of Aceh Province. Lake Laut Tawar, one of the famous tourism destinations in Aceh Province is located in Takengon City likewise. Many tourists, either domestic or local, come to Takengon City to visit and to spend some nights there around Lake Laut Tawar. Besides, Takengon City also offers you other tourism destinations such as Puteri Pukes Cave, Pantang Terong, Wih Pesam Hot Spring, Terong Hill (Khafi Peak), Loyang Karo Cave, Menye Beach, Ketibung Beach, and the Monument of Pacuan Kuda (horse race). The last one is held in a different way. The jockeys are naturally well-trained children, so they seem amazingly brave to participate in the horse race without using saddle. At least there are 20 tourism destinations in Takengon City, so many choices for you for having tourism there. The indigenous people of Takengon City come from Gayo tribe that is the offsprings of Batak Karo from North Sumatra. Moreover, the mother tongue of the inhabitants is also different from Aceh people‘s mother tongue. Dealing with its locaton in the highland of Gayo, Takengon City is famous as a city which has fresh air and maginificent view of surrouding area. Gayo Coffee as the main commodity of Takengon City, has been exported to Japan, USA, and Europe. The other export commodities are tomato, markisa, vegetable, corn, chili, potato, tangerine, avocado, and tobacco. 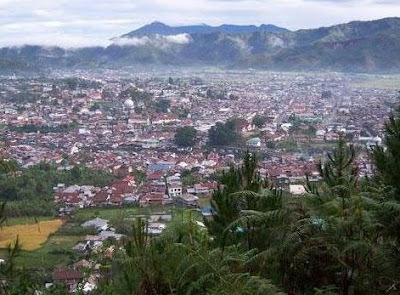 Takengon City is the capital of Central Aceh District, Nangroe Aceh Darussalam Province. You can easily access Takengon City from Bireun City, where you can find a small bus station. You can take a type of public transportation that will carry you directly to Takengon City with IDR 25.000 for its costs (January 2008). It is approximately five hours to reach the location from Bireun City. Moreover, you can also reach the location from Blang Kejeren or Kutacane. As an additional information, Bireun City is the capital of Bireun District, Nangroe Aceh Darussalam Province, Indonesia. The entrance tickets of those 20 tourism destinations scattered in Takengon City are in the confirmation process. Remembering that Takengon City is the capital of Central Aceh District, you can easily find some middle-class hotels as well as stars hotels. Nearby the cave tourisms, there are some speedboat rentals with reasonable prices for you who want to enjoy the magnificent view of Lake Laut Tawar.